Our Disney Memories from 2012, here we are at Akershus! Hello everyone, and welcome to back to our Disney Memories series. For this post, we are taking a look at our Disney Memories 2012, that special trip that we took with Kerry, Neal, River, Izaiah, Monica, Madelyne-Lois, Shane, Kyle, and Stephanie. The buildup for this trip was incredible to me, it felt like it would never get here! For this trip, we stayed at Kidani Village, which is part of the Animal Kingdom Lodge, and had a great time! It was the first trip for everyone except us, Stephanie, Shane, and Kyle, and we made sure we did some things that they would remember for the rest of their lives! 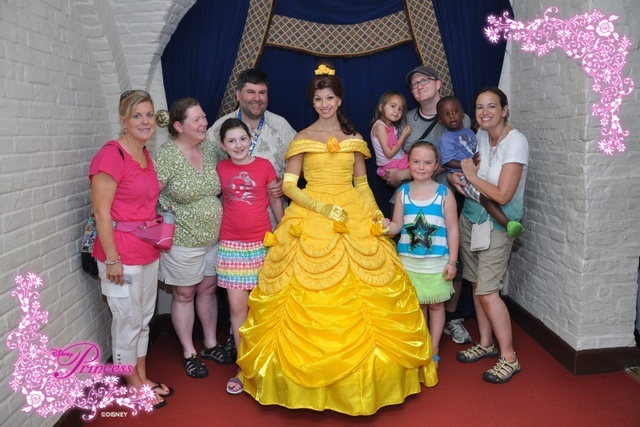 In the first picture, all of us (except Kyle, Shane and Stephanie, who ate separately from us) were posing with Belle for our picture before dinner at Akershus for Princess Storybook Dining. This excellent restaurant is located in Norway in Epcot’s World Showcase, and is a favorite of mine. In addition to Akershus, we ate at the Crystal Palace, Via Napolli, Cinderella’s Royal Table, the Garden Grill, and Chef Mickey’s. Sophie had the Dapper Dan’s play Happy Birthday to her previously, and this time also! This trip was special because Cindy and I had some time to see the parks by ourselves! 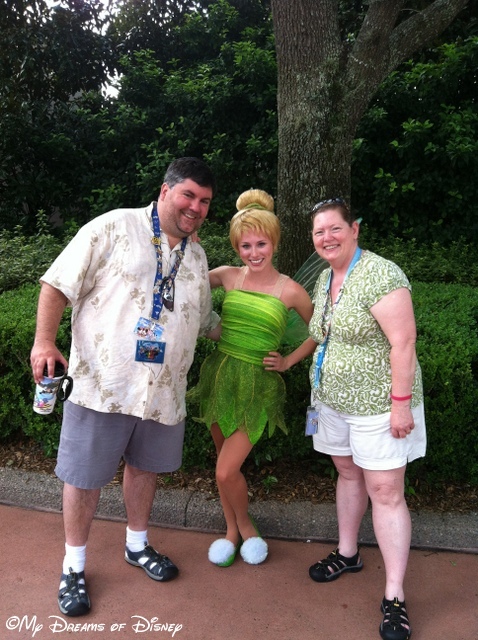 This picture of Cindy, Tinkerbell and myself is special because we were entering Epcot by the International Gateway and there she was with hardly no line! It was a great surprise and some neat Disney Magic! 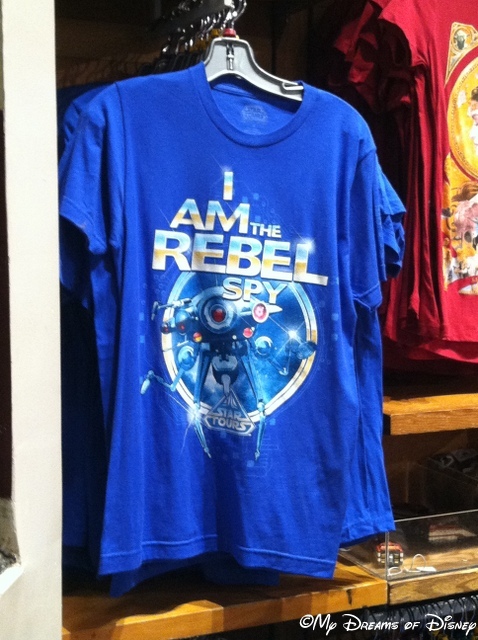 When we rode Star Tours, I actually WAS the rebel spy! We rode Star Tours one night, and there wasn’t much line at all, but the seating worked out that most of our party was in the very back, and Cindy and I were in the row in front of them. It was so funny when we got in and got going — this being the first time we had ridden it since the renovation, mind you — and I was selected as the Rebel Spy! It was so funny! The night before we were going to be checking out, Cindy and I went down to where the car was parked to take some things there so we wouldn’t have to mess with them in the morning. 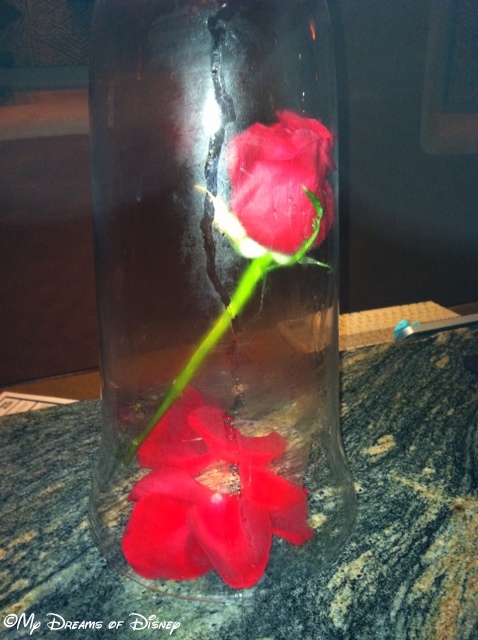 When we came back, we stopped by the lobby, and this rose was right on the check-in counter. It was so cool, Disney Magic was at it’s romantic best! By far, though, my most lasting Disney Memory was of Stephanie and Shane. 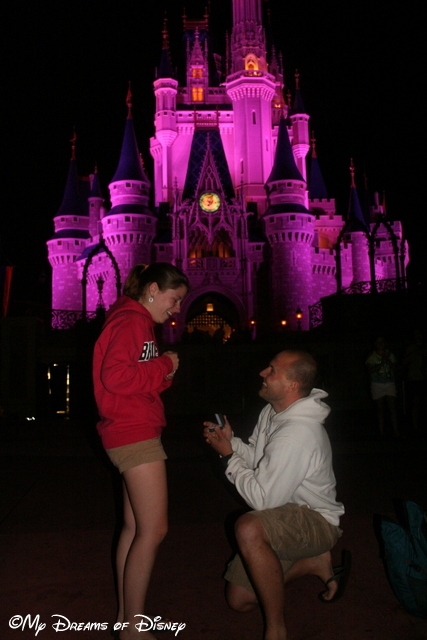 Without a doubt, though, my all time favorite Disney Memory from that 2012 trip was this one — the night that Shane proposed to his girlfriend (and now wife) Stephanie in front of Cinderella Castle. I knew it was going to happen, so I was asked to be there to take photos, and I was lucky to get this one amidst all the tears that were flowing. They are such a wonderful loving couple, every time I see them and this picture it brings a smile to my face. Today also just happens to be the birthday of Stephanie, so what better way to celebrate than by remembering this moment that is frozen in time for all eternity! Thank you for stopping by to visit and relive our Disney Memories 2012! 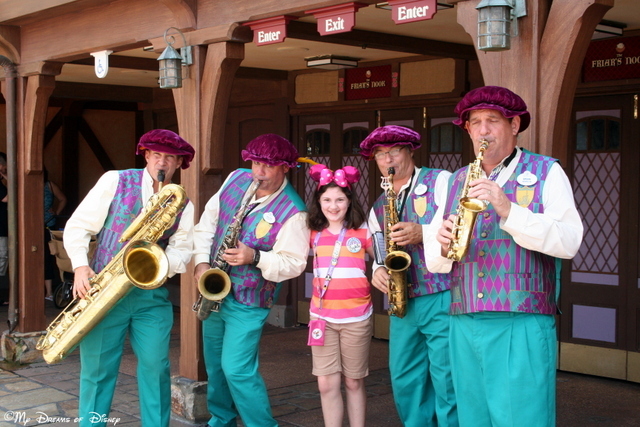 What special Disney memories do you have? Please let me know in the comments, and thank you for stopping by! Now, please go out and make today a great Disney Day! There was a time when anything the Bradford Exchange slapped on a plate sold for $50.00 or more and promises of great increases in value filled collectors heads with dreams of big profits in the future. But the reality became that the bottom dropped out and now you can pick these same plates up for $10.00 each at almost any flea market. Sometimes framed! Disneyland artist Charles Boyer, known for his many years of creating beautiful paintings and sculptures commemorating special Disney milestones, did the illustration for this magnificent plate. This particular one is number 783 of 25,000. It comes complete with a box, box cover, explanatory pamphlet, and because the lady I bought it from was diligent, the original sales receipt! Enlarge and enjoy the reading! This particular plate was bought on Main Street in The Magic Kingdom (WDW) on November 18th, 1988 at 7:09 p.m. Debbie, the lady I recently purchased it from, bought it to decorate her then young daughter’s room. But now that the daughter is grown and has left the nest, the Disneyana had to go. But like I mentioned at the outset, the value of these plates is hard to maintain, and so I paid only $25.00 CAN to obtain it for my collection. As with any collectible, if you have the full story of how it was purchased, where it has been, and who has owned it, you can rightly lay a claim to increased value. But for me, it’s never the money that matters: I just love a good story!